We provide an excellent range of first aid courses to in-house groups in Oxfordshire, Wiltshire, Northamptonshire, Buckinghamshire, Warwickshire and are continually expanding our locations to include new areas. Our CPR, AED and medical emergency training is specifically suited for dental or GP practices and other healthcare professionals. 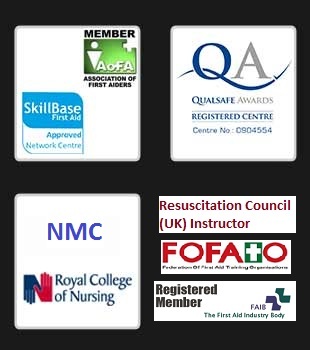 Our first aid, AED and CPR courses for professionals in the education sector, care workers and businesses. Thank you so much for our in-house ILS + PILS course – it was excellent, both in terms of its content and relevance and was very much appreciated by everybody. Being in primary care, we are fortunate that we deal with cardiac arrests very infrequently but the imaginative way in which Lynn delivers the training means that we are now significantly better prepared to assess and treat a sick patient in the far less secure setting of a GP surgery. Senior partner, North End GP Surgery, Buckingham, Bucks. Thank you so much for our session. It was very informative, clear and concise. Lynn was an excellent presenter. Great course that focused on first aid for children that was adapted to our schools specific needs. Brilliant! I have been doing these first aid at work courses for so long now and I think this was definitely the first time some of the reasons behind the actions were properly explained. This is so much more helpful as then you can make judgments about other situations you have not been taught because you have the principles behind the actions. On behalf of Bucks Branch of the Society of Chiropodists and Podiatrists, I would like to express my thanks for your professional and informative CPR day that you instructed for us. Excellent training. Very friendly and interactive. A great course.